Lake Erie borders four states and Canada and is the fourth largest of the Great Lakes. It produces more consumable fish than all of the other combined Great Lakes making it a great place to visit, vacation and live. Species known to inhabit the lake include wallhanger walleye, trophy rainbow trout, jumbo yellow perch, and small mouth bass. It is the warmest of the Great Lakes in the summer and the first to freeze in the winter. Lake Erie Docks must be in a protected area of the shoreline since the lake is known for “lively” waves. Protected areas along the shoreline provide a much needed buffer for marine dock systems. The most common Metal Craft Dock on Lake Erie is the truss frame floating dock. 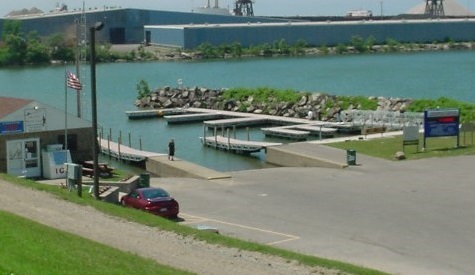 The central basin of Lake Erie located off the shores of Ashtabula Township features a Metal Craft Dock system. The system is comprised of 5′ wide and 15′ – 20′ length sections. An ADA compliant aluminum gangway makes accessing the community docks easy. Metal Craft Docks are made of aluminum components and stainless fasteners, thus requiring little maintenance. All floating docks feature poly floatation so they are environmentally safe. Frame docks are used in commercial and residential sites when the water levels fluctuate greatly or have large amount of wave or wake movement. Aluminum trusses provide structure while hinge connectors allow flexibility. Subsequently, floating docks can move independent of each other yet in rhythm with the changing water level. If you are interested in having a quality product for your lake front property, consider contacting Metal Craft Docks for a dealer near you. Lake Erie Lifts are a necessity for protecting watercraft from harsh water. Metal Craft Lifts are available in four boat lift models and two jet ski models. Vertical boat lifts are available in 4000 and 5000 lb. models. All Metal Craft lifts feature 100% aluminum components with stainless steel fasteners and nylatron pulleys. Vertical lifts allow for an open structure, thus making boarding from either side easy. Deep “V” front and rear cradle designs allow for easy entry on the lift in shallow water. Basic boat lift options include standard carpeted bunks. Upgrades such as a pontoon lift kit, boat guide ons, and a lift canopy allow for customization. Additional accessories include electric motor, “L” shaped guide-ons, and solar panel light options. Cantilever PWC Lifts are available in two sizes 850 and 1200 lbs. The model lift you’ll need is based on the weight of your water craft. Jet ski lifts feature aluminum structural components, Dutton-Lainson winch, and stainless steel fasteners. Model 850 comes with 6′ long carpeted bunks. The larger 1200 model features 7′ carpeted bunks with adjustable swivel brackets. Contact Metal Craft for more information or a dealer close to you for installation. Metal Craft Docks recently celebrated 80 years of manufacturing aluminum boat docks. We are very proud of our history; History that began when two German fabricators started a small fabrication shop in Cleveland, Ohio. Metal Craft Docks and Lifts are made entirely of aluminum so they are naturally light-weight making installation and removal for storage easier. We are proud of the craftsmanship that goes into every one of our products manufactured locally in our Mentor, Ohio facility. When you purchase a Metal Craft Dock and Lift you are making an investment. We know you will be happy with your Metal Craft purchase for many decades into the future!